Jason Dovel enjoys a busy career as an educator, performer, and composer. 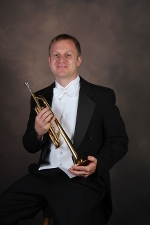 He joined the University of Kentucky (UK) School of Music faculty in 2013, where he teaches trumpet lessons, directs trumpet ensembles, and serves as principal trumpet of the Faculty Brass Quintet. His debut solo CD, Lost Trumpet Treasures, was released in 2014 by Mark Records. He is also a member of the Ash Lawn Opera Orchestra in Virginia. He has published articles in the Music Educators Journal, International Trumpet Guild Journal, The Instrumentalist, and the Journal of the Art College of Inner Mongolia University (China). Also active as a composer, his compositions and arrangements are available through Prestissimo Press, Hickman Music Editions, the Baroque Trumpet Shop, and Mountain Peak Music. Prior to his appointment at UK, he taught at the University of North Texas, North Central Texas College, and Northeastern State University.